At the corner of Colfax and Broadway stands the Pioneer Monument, a triangular fountain (except when the water is turned off during the winter or water rationing) paying tribute to those who crossed the Great Plains from the Missouri River to Denver along the Smoky Hill Trail. The trail, although more dangerous than other prairie trails, became the principal route for prospectors seeking fortune during the Colorado Gold Rush of 1859. The monument sits at the end of the Smoky Hill Trail. Designed by Frederick MacMonnies, it was dedicated in 1911 along with Civic Center Park. 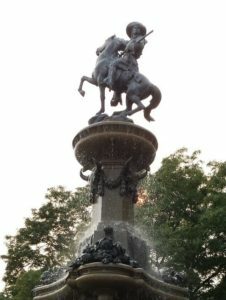 At its apex is a bronze figure of Kit Carson on a horse and around the rim of the fountain are three additional bronze figures – the hunter, the prospector, and the pioneer mother. The artist’s original design called for a Sioux warrior at the top of the fountain, but there was such an uproar about it that the artist switched the apex figure to the famous scout. 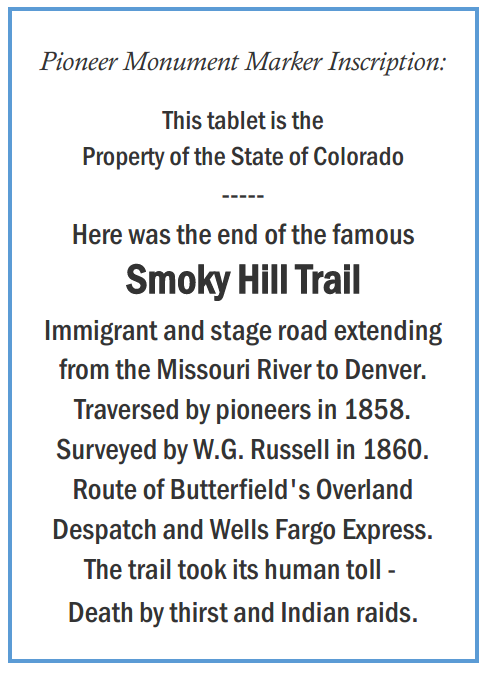 The State Historical Society of Colorado added the plaque memorializing the Smoky Hill Trail in 1936. As news of the gold found along the Cherry Creek quickly spread, would-be prospectors began traversing the country to seek their fortunes. There was, however, no official route connecting the East to Denver. The westernmost traveling point at that time was one of the jumping off points for the Oregon Trail in Salina (about 175 miles southwest of Leavenworth, Kansas). Prior to the Colorado gold rush, those traveling west would turn North or South to their destination in order to avoid the high peaks of the Rocky Mountains. To shorten the route from Kansas towns to Denver, frontiersmen began using an old Native American buffalo hunting trail along the Smoky Hill River. In 1859, an editorial in the Rocky Mountain News condemned the men and newspapers in the East encouraging people, in their rush for gold, to start out on the Smoky Hill Trail with inadequate provisions and the expectation of a good road and good camps with plenty of wood and water. Instead, there was no road, very little wood and, in many places, no water. 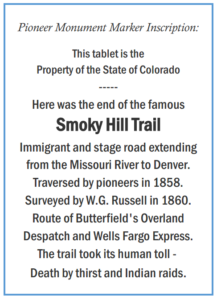 Not deterred by the lack of food, scarce water supplies, frigid temperatures, and attacks by local tribes, thousands of prospectors, homesteaders, and soldiers traveled the Smoky Hill Trail between 1859 and 1865. Pioneers traveled in covered wagons or on foot pushing carts and wheelbarrows with many, especially that first year, barely surviving the trek. In Colorado, the largely unmarked trail separated into North and South paths, both ending in Denver. At one point there was a third path, called the “Middle Smoky Hill” which later became known as the “Starvation Trail” when the members of the Blue party were forced to resort to cannibalism to survive. Once the lone survivor (only because he was saved by the Arapaho) made his way to Denver with his tale, travel on the trail stopped while it was surveyed and more clearly marked to show the location of the trail and the best route for water. A couple of stage lines started up and failed before the Butterfield Overland Dispatch was able to establish stagecoach transportation in 1865. The Dispatch built relay stations about every 12 miles along the 592-mile long route. Forts were built and soldiers posted along the stage route to protect the stations and travelers. By 1870, the Kansas Pacific Railroad pushed toward Denver, eliminating the need for stagecoaches. During the trail’s days of popularity, a number of famous and colorful characters traveled its path, including Generals Custer and Sheridan, Wild Bill Hickock, Wyatt Earp, John Wesley Hardin, and Buffalo Bill Cody. The trail also saw its share of bloodshed and death. Today, the old trail has several markers, old forts, and museums along its route from Kansas to Denver, ending in the Pioneer Monument in Denver. The word “Dispatch” is spelled “Despatch” on the plaque. Next Post: Does Colorado Have a “Stand Your Ground” Law?